Thinking about my folks who are visiting Palermo, I’ve been craving a good Italian roast coffee and a pumpkin latte. While pumpkin spiced lattes isn’t synonymous with Italy, I decided to combine the two in my version of this popular drink. I love maple syrup and used it in lieu of traditional white sugar to keep this paleo-friendly. Of all the pumpkin spices available, I prefer Trader Joe’s version because it uses cardamom, which I feel adds a nice layer of flavor. After dabbling in the kitchen to get the flavors just so, I think this is one of the best versions I’ve made. I hope you think so too! Enjoy this latte while curling up in your favorite chair with a good book like my new release, Balanced Life Happy Life. May this latte bring you a some happiness this weekend. Have french press ready to use. In a coffee grinder, grind beans until it is slightly course, but not finely ground. Put the coffee into base of french press. Heat up water and remove from burner just before boiling. Pour the hot water over the coffee grounds in french press, then put the plunger in but do not press down. Leave to steep for 4 minutes. 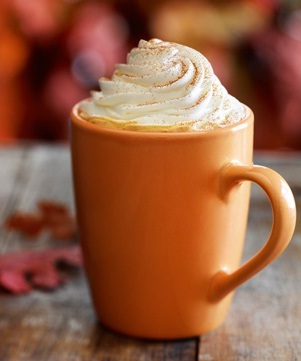 In a mug, mix together the pumpkin, maple syrup, coconut milk, pumpkin spice, and vanilla. Put mug in microwave and heat up for 1 minute and 15 seconds or until hot. After 4 minutes of steeping the coffee, press the plunger all the way down and without removing plunger, pour the coffee into the mug with your pumpkin maple milk. Mix and enjoy! Optional: Top beverage with a heaping scoop of whipped coconut cream. Or for a frothier version, all ingredients except the coffee and water in a milk frother. We are all pressed for time or may not have the tools locally available. I add affiliate links to help out my readers. In turn, I make a small commission from these links. Maybe it’ll be enough to my dog a chew toy or a postcard of Italy. In any event, thanks for supporting Tasting Wellness!